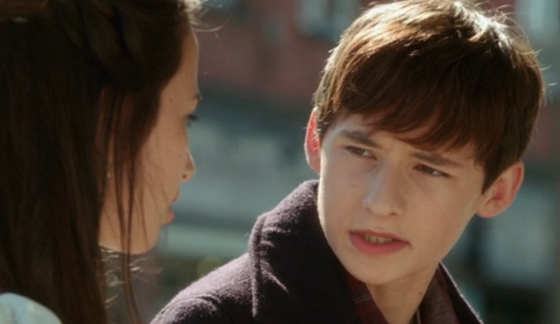 Jared Gilmore plays Henry on Once Upon a Time. Once Upon a Time Season 5 continues with a new episode ("Dreamcatcher") on Sunday, October 25 at 8 p.m. ET/PT on ABC. In the sneak peek below, when Henry sees his crush Violet's sadness over her missing horse, he turns to the one person he knows can help: Emma. The Once Upon a Time cast includes Ginnifer Goodwin as Snow White/Mary Margaret, Jennifer Morrison as Emma Swan, Lana Parrilla as the Evil Queen/Regina, Josh Dallas as Prince Charming/David, Emilie de Ravin as Belle, Colin O’Donoghue as Hook, Jared S. Gilmore as Henry Mills, Sean Maguire as Robin Hood, Rebecca Mader as the Wicked Witch/Zelena and Robert Carlyle as Rumplestiltskin/Mr. Gold. Guest stars in tonight's episode include Amy Manson as Merida, Elliot Knight as Merlin, Liam Garrigan as King Arthur, Joana Metrass as Guinevere, David-Paul Grove as Doc, Mig Macario as Bashful, Olivia Steele Falconer as Violet, Ryan Robbins as Sir Morgan and Guy Fauchon as Vortigan.